Aphria, one of Canada’s biggest cannabis producers, reported disappointing third-quarter results that missed analyst expectations, but showed signs of moving forward after several months of turbulence. The Leamington, Ont.-based company settled its hostile takeover offer with Green Growth Brands, took a one-time $50-million impairment charge relating to its Latin American operations and acknowledged the supply shortages and packaging constraints that led it to a net loss of $108.2 million. The company also added two prominent directors to its board and commenced a 90-day strategic plan to evaluate its global operations. Aphria hopes its new automation line will be part of its plan to reduce labour costs over the second half of the calendar year. Of course, there was another Canadian cannabis producer that reported quarterly results on Monday. 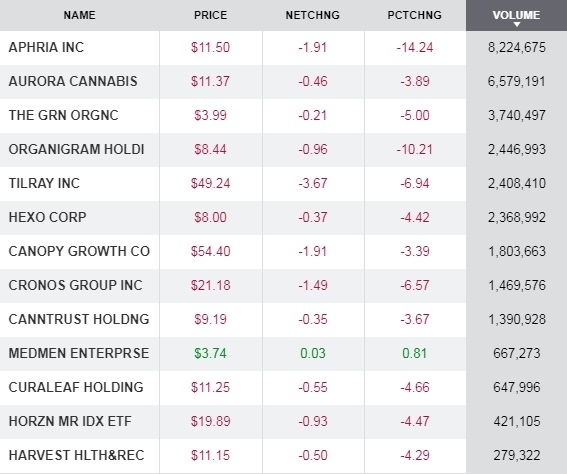 Organigram swung to a loss of $6.4 million in its latest quarter but its revenue soared in its first full quarter of adult-use recreational sales in Canada. The Moncton-based company said revenue rose to $26.9 million, up from $3.4 million a year earlier and beating analyst expectations. Part of the higher costs were attributed hiring additional staff as it moved to round-the-clock production and supplying more pre-rolled joints, which are costlier to produce. The marijuana producer is focused on the next phase of recreational cannabis in Canada — edibles, and has purchased a chocolate moulding line in anticipation of those products hitting the market later this year. There’s also the pot companies looking to produce pot without actually growing the stuff. Confused? Well, several cannabis producers are investigating ways of making synthetic THC and other cannabinoids in a lab, using ingredients such as sugar and yeast in the process. The Canadian Press’ Armina Ligaya reports that synthesizing marijuana could potentially produce these active compounds more cheaply than traditional cultivation and extraction method. Organigram and Cronos Group have already made significant investments into the space, while CannTrust’s CEO says he’s spoken with several firms to collaborate with a short list of biosynthesis companies. - Peter Horvath, CEO of Green Growth Brands, on why the company decided to back off its bid for Aphria and accelerate the expiry date.